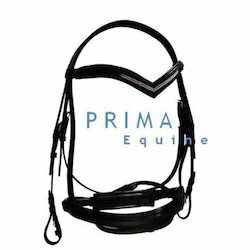 With the assistance of our skilled professionals, we are involve in offering a diverse range of Noseband Leather Bridle to our valuable clients. This nose band is appreciated by our clients for its various features all over the nation. The offered band is widely used to keep dust and flies stay away from horse nose in domestic as well as international markets. Our band is tested on various parameters in order to deliver high quality range. We offer this band at affordable prices within stipulated time frame.